Conan O'Brien is back with his "Clueless Gamer" segment in which he plays the latest video games and shows how little he actually knows. He's had hits in the past, my favorite being his Mortal Kombat episode with Marshawn Lynch, but this time he's digging into something I genuinely want to play. 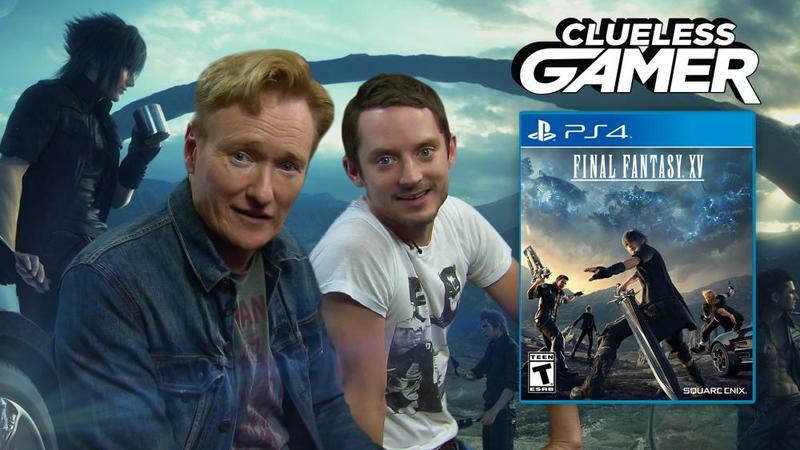 He enlists Hollywood's biggest gaming nerd Elijah "Frodo Baggins" Wood to help him out, but Conan just can't bring himself to like the game. "I don't know what we achieved. I don't know what we were trying to achieve. I have no sense of satisfaction." "This whole thing is like an epic blue balls waste of time." "Why would someone play this?" Even Wood doesn't seem that into the game, which is saying a lot because he does know his way around the gaming scene. Maybe someone forgot to tell Conan that Final Fantasy fans are some of the most sensitive on the Internet when you talk trash on their beloved franchise. It's fine guys, this is all for the sake of comedy. They had Conan jump around to different points in the game, and he didn't get to play the overall adventure or fine tune his characters or other high points of the series. I don't think he particularly would want to anymore after this, but sometimes RPGs just aren't for everyone. Go easy on him. No anger, okay? Final Fantasy XV will launch for the PlayStation 4 and Xbox One on Nov. 29.